If p(t) = f(t)·g(t), then why doesn't p'(t) = f '(t)·g'(t)? which approaches f(t)·g'(t) + g(t)·f '(t) as h goes to zero. Thus, p'(t) = f(t)·g'(t) + g(t)·f '(t). This is the product rule for derivatives and can be used to easily determine the derivative for any power of t, and hence for any polynomial. Polynomials are easy to calculate. Functions other than polynomials, like radicals, exponentials, and trigonometric functions, are generally impossible to calculate directly. The solution to this delimma: approximate these functions with polynomials. Taylor's theorem makes this possible. Taylor's theorem gives a bound on the error of the approximation as t moves away from 0. 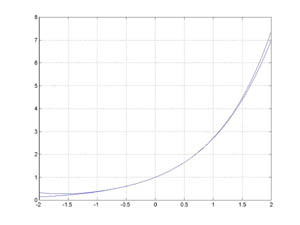 We show how to construct polynomial approximations to exponential and trig functions below. Quick proof of Taylor's theorem: the nth degree polynomial approximation p(t) to a function f(t) at t = 0 is constructed so that p(0) = f(0), p(i)(0) = f(i)(0) for i <= n. Let e(t) = f(t) - p(t), then e(i)(0) = 0 for i <= n, and e(n+1)(t) = f(n+1)(t). Suppose f(n+1)(t) < M for some interval 0 <= t <= h. Now, e(n)(0) = 0 and the rate of increase of e(n)(t) is < M, so e(n)(t) < M*t. And thus, e(n-1)(0) = 0 and the rate of increase of e(n-1)(t) is < M*t, so e(n-1)(t) < M*t2/2. And thus, e(n-2)(0) = 0 and the rate of increase of e(n-2)(t) is < M*t2/2, so e(n-2)(t) < (1/2)*M*t3/3. And so on, so that e(t) < (1/(n+1)!)*M*tn+1. Believe it or not the above is way simpler than anything you'll find in a textbook. Here's the country version of this proof: if your old hound's maximum acceleration is M, and he runs for t seconds, than at most he has reached a velocity of M*t, n'est pas? So, he has travelled at most (M*t)*t. Had it been the hound's maximum 'jerk' (rate of change of acceleration) that was M, then, by the same argument, the hound's max acceleration at time t would be M*t, the hound's max velocity M*t*t, and the hound's max distance M*t*t*t. This is the basic principle underlying Taylor's theorem. (It only takes a little finagling to get the denominator (n+1)! as shown above ). This is the easy proof. Thinking of p(t) as a position function, the right side of the equation is the position at time t2 minus the position at time t1, that is, the distance traveled in the interval t1 to t2. If p(t) represents constant velocity motion, then p'(t) = V is constant and the area corresponding to the integral is a rectangle, the height of the rectangle p'(t) = V, and the base of the rectangle is t2 - t1. Thus the area is V*(t2 - t1), and the FTOC is equivalent to the familiar formula velocity*time equals distance, V*(t2 - t1) = p(t2) - p(t1). If p'(t) is a step function, then the area corresponding to an integral of p'(t) is a sum of rectangles, one for each subinterval, and the formula area = velocity * time = distance holds for each subinterval. Summing the areas of the rectangles gives the value of the integral. And, believe it or not, all the work has been done. We can approximate any velocity function p'(t) by a step function, call it pa'(t), and the area under p'(t) will for all practical purposes equal the area under pa'(t) and hence their integrals will be equal. Then pa(t) is a position whose velocity matches that of p(t) and hence the distance travelled by pa(t) matches the distance travelled by p(t), and the theorem is proved. Let p'(t) be any function with anti-derivative p(t), then a step function can be constructed so that it is very close to p'(t). An example is shown to the left. How close can p'(t) be approximated? 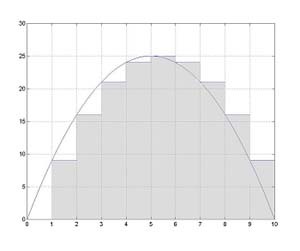 Consider, if the subinterval size was chosen to be equal to the pixel size on your screen, then p'(t) and its step function approximation would be indistinguishable on your monitor. That is, it can be approximated very, or arbitrarily, close, as close as you want. The antiderivative of the step function is then very close to p. The antiderivative of the step function above is graphed along with p to the left. 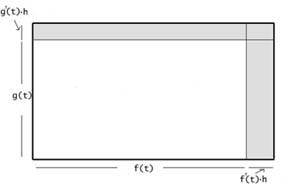 Since the FTOC is true for the step function, it follows that the FTOC is true for p'(t). The good news is that we have now covered the calculus of polynomials. The bad news is that the functions that describe nature are usually not polynomials. Let's look back for a minute - in Vol. 1 we analyzed the motion of a runner running at constant velocity, this example is very 'unnatural' as a real runner accellerates and decelerates throughout a race. In Vol. 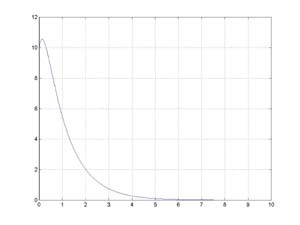 2 we analyzed the trajectory of a falling object, but to get the result we wanted, a polynomial solution, we had to assume that gravity was constant, and this is another unnatural assumption, as gravity is not constant. In the last chapter of Vol. 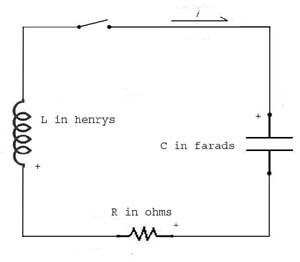 2 we studied simple circuits, and I could not find a circuit that produced a polynomial solution for current or voltage, so we could not solve even the simplest circuit analytically, and had to use numerical methods (note: this is what usually happens in engineering). So, if polynomials do not occur in nature, what functions do? Stay tuned. It's easy to define the meaning of fractional exponents. For example, y1/2 is the square root of y, that is the number that when multiplied by itself equals y. Similarly, the cube root of y, y1/3, is the number that when multiplied by itself two times equals y. However, calculating the value of a fractional exponent is usually not so easy. 51/2=?. Here is a surprise: while we may not be able to directly calculate the values of a fractional exponent function, we can differentiate the function. Note that if q(t) = t2, then q(p(t)) = t. Differentiate both sides, using the chain rule to differentiate the left side. Now with a hop, skip and jump we show that [t1/2]' = 1/2t-1/2. Similarly for t1/n for any positive integer n. Another use of the chain rule gives [tm/n]' = m/n tm/n -1 for any positive integers m and n. If we can't directly calculate values of fractional exponent functions (or exponentials or trig functions), how does our calculator do it? Read on. f(t) = 1 + t + (1/2)*t2 + (1/3*2)*t3 + ... + (1/n!)*tn. 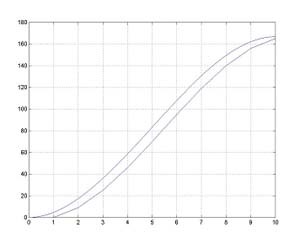 exp(t) is shown with its 4th order polynomial approximation in the figure. The natural log function is the inverse of exp, that is ln(exp(t)) = t. We use the chain rule to show that the derivative of ln(t) is 1/t. We know the derivatives of all orders for 1/t, so we can construct polynomial approximations to ln. The values of exp and ln are calculated by using polynomial approximation. Ln and exp can then be used to calculate the values of fractional exponents. exp(t) is one of nature's favorite function because it 'looks like' its derivative, and that makes it a prime candidate to be a solution to the homogeneous differential equations that play a part in the analyses of most physical systems. We analyze first order systems occuring in mechanics and electrical circuit theory. 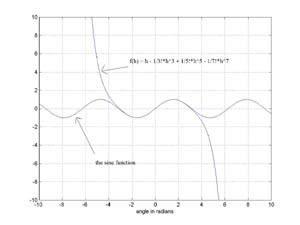 The basics of plane trigonometry are covered in five lessons, with the goal of defining the sine and cosine functions, and deriving the trigonometric identity needed to differentiate them (sin(A + B) = sin(A)*cos(B) + cos(A)*sin(B)). f(t) = 0 + t - (1/3*2)*t3 + (1/5*4*3*2)*t5 + ... + (-1)n(1/(2n+1!)*t2n+1. 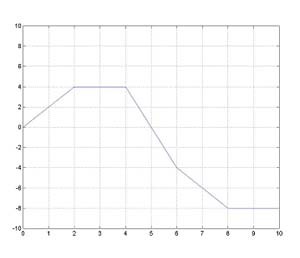 sin(t) is shown with its 7th order polynomial approximation in the figure. Values of trig functions are calculated using polynomial approximation. We have sin'(t) = cos(t) and sin''(t) = -sin(t), so that the second derivative of sin(t) is a multiple of sin(t), and sin(t) is also a candidate solution for a homogeneous differential equation. We defer examples to the next chapter. Linear second order systems are used to model a wide variety of physical phenomena, and are the basic building blocks of engineering analysis. The differential equation for a linear second order system can be written p''(t) + c*p'(t) + k*p(t) = f(t), with all the terms containing a derivative of p on the left side and the 'forcing function' f on the right. If the forcing function is replaced by 0 we have the homogeneous form of the equation; this equation characterizes the unforced motion of the system. It is 'homogeneous' because all the terms contain p or a derivative of p. Exponential and trigonometric functions provide the solutions to homogeneous DEs, hence, they are nature's favorites, and they figure in almost every engineering analysis. 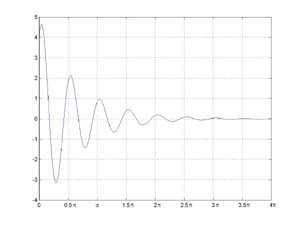 In the case where the spring is strong, i.e., k2 - (c/2)2 > 0, the solution to the DE, and the motion of the block, is damped oscillation and is the product of an exponential and a sine wave, with p(t) = A*exp(-l*t)sin(wt + o). The solution can be rewritten, using our favorite trigonometric identity from the previous chapter, as p(t) = B*exp(-l*t)*(B*sin(wt) + C*cos(wt)). Using this form it is easy to solve for the constants B and C to meet the given initial conditions. 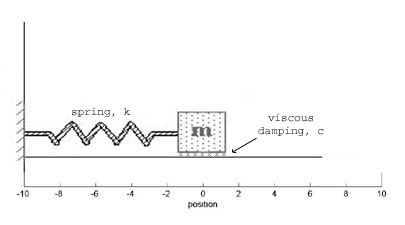 An example of damped oscillation is shown in the figure. In the case where the spring isn't so strong, i.e., k2 - (c/2)2 < 0, the system doesn't oscillate and has a solution that is a sum of exponentials of the form p(t) = A*exp((a+b)*t) + B*exp((a-b)*t). 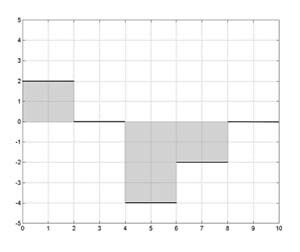 A representative solution is shown in the figure. Wait a minute, this differential equation is mathematically identical to the one for the spring-mass assembly, the only things having changed are the names of the function, variables and constants. So, the solutions are the same.